The vast majority of gamblers have their own luck superstitions. They follow them as their destinies depend on these sacred procedures without any doubt. Some of them carry a four leafed clover or always keep a rabbit foot in the pocket. Others just blow on the dices or wear special clothing. Some of slot gamblers have their favorite machines, sits or even gambling areas. And all of them believe in fact that slot machine payouts and winning combination probabilities are highly dependent on slots luck superstitions. 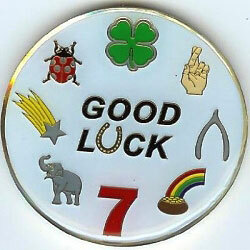 In this article we will consider the most famous luck superstitions on slot machines gaming. Some players believe hot or cold coins may cause the gameplay and force slot machine to burst out paying slots money. So they warm up or cool the coins off (don't ask how) before drop them into machine. Stand playing is the next luck superstition players follow. So forget the free chairs options and train your gastrocnemius muscle while performing slots. Other luck superstition deals with the club card which is offered to a player. Some of slots enthusiasts consider the ability of casinos to track their winnings via cards reading as a bad luck. Thus they prefer cash bankrolls instead of Big brother watching cards. Operator interrupts the game? The luck is scared off - be sure. Direct your despise eyes to operator and switch over to the next machine. Many slot players seriously think that new slot machines set in just opening, fresh casinos are more likely to bring you lots of money than the old ones. So don't be surprised with a statement that "new slots are more favorable for you, my friend." Location of a slot machine plays a principal role according to some luck superstitions. In fact, the slot tips usually advise you to choose the one hand bandit which is placed in crowded places: near entrances, lifts or bars. It's believed that casinos put the loose machines (which are more favorable for a player) in the public eye. Thereby they try to attract more players via the atmosphere of total luck and win. For many players it's fun to dream that slot machine "owes" you something. It means when you feed enough money to a slot machine it must pay you back with winning combination or even jackpot. It's okay that machine doesn't really matter who you are or how much cash have you spent - the true is: a slot player likes to believe in luck superstitions and deceive oneself as well. Follow the fair-play slots recommendations. Behave yourself and be sure you'll play with fun and ease. Improve your playing time via helpful recommendations. 8 secrets which aid you to play more effectively. Stop being a cloud-land dweller - discover the proven tips only. Improve your online slots gaming via presented facts. Wish to know how to play online slots better? Let the myth busters sweep unnecessary slots stories aside. Avoid slots delusions and study checked data only.